Heat waves. Floods. Wildfires. Hurricanes. Ice storms. It seems that we hear about another disaster – natural or otherwise – somewhere in the world every week. These events can be devastating to our communities, especially their most vulnerable members. Most of the injuries and deaths that happen during natural disasters involve seniors. What can we do to protect our loved ones during a crisis? A week-long heat wave that hit southern Quebec in July 2018 is believed to have caused the deaths of up to 70 people; the majority were people over 60 who had chronic illnesses. Seniors in their 70s and 80s were the hardest hit during 2017’s wildfires in California and hurricanes in Puerto Rico, Florida and Texas – many of these deaths were considered preventable. And when a tsunami struck Japan in 2011, more than half of the people who died were age 65 or older. As Canada’s population ages, we are likely to hear more of these tragic stories. Seniors are made vulnerable by the physical changes that come with aging, including reduced mobility, poor health, frailty, and diminished hearing and eyesight. Seniors may also be isolated or living in poverty, and they may not receive adequate support from their communities, even prior to an emergency arising. Planning ahead for what to do in an emergency could save your loved one’s life. Here are four ways you can help your senior loved ones in case of disaster. If they live alone, they may be on their own for a few days until help arrives, so it’s especially important to be prepared. 1. Create a 72-hour survival kit. 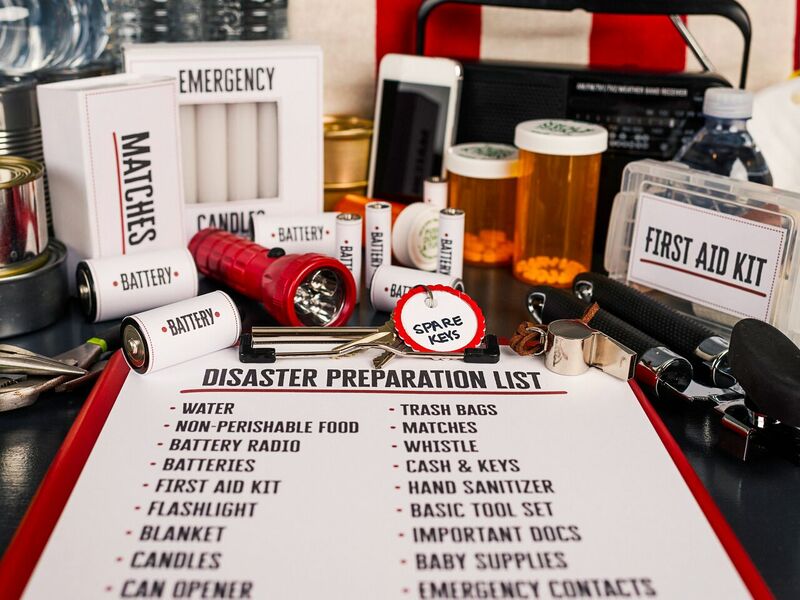 The survival kit should contain non-perishable food and water (two to four litres per person, per day), as well as a can opener, a first aid kit and manual, a flashlight and spare batteries, a battery-powered or hand-crank radio, a “grab and go” kit with a two-day supply of medications and other medical supplies, spare clothing, waterproof matches, candles, cash, a cell phone charger, toiletries, toilet paper, moist towelettes, copies of important documents (e.g., birth certificates, insurance, licences, wills, deeds) and an extra set of keys (house, etc.). If needed, also include spare glasses, hearing aid batteries, incontinence products and other necessities. For items that expire (such as food, water, medication and batteries), refresh as needed. If your loved one lives in a cold climate, ensure they have sufficient clothing and bedding to stay warm in case of a power outage. Determine who’s in your loved one’s support network and who can act as emergency contacts; they could include family, friends, neighbours, caregivers and other community members. Together, decide what to do in case of different urgent situations. Prepare a list of names and contact info and put it in the kit, and give a copy to each person. Also include the locations of local resources, such as emergency shelters. Find out if your loved one’s community has a “vulnerable persons registry” (see “Additional resources,” below). Talk to your senior loved one about disaster preparedness and, if possible, involve them in creating the emergency action plan. Post emergency phone numbers somewhere your loved one can easily find them. 3. Write down medical information. Prepare a detailed document that includes your loved one’s medical conditions, medications (names, dosages, schedule), allergies, surgeries, family medical history, insurance details, vaccinations, health screenings, blood type and contact info for physicians, pharmacies and hospitals. Include any special instructions about your loved one’s care. Put a copy of the document in the kit and share it with others in your loved one’s support network. 4. Make a plan for pets. If your loved ones must be moved out of their homes into other accommodations, they may not be able to bring pets. Decide who will care for their pets until the emergency is over, and make sure you know where your loved ones keep items such as pet carriers, leashes, food, vaccination records, etc. Need help building an emergency kit? Bayshore HealthCare can help. Contact your local branch to ask how one of our team members can assist. We’ve been helping people age safely in their homes for over 50 years with home care services including personal support, companionship, light housekeeping and meal preparation.